oo many organizations are currently caught in a “green slump,” struggling to engage in sustainability projects and making far less progress than they should be. Some businesses are striving to lead the way by equipping their facilities with new, energy-saving technologies or creating projects that contain post-consumer materials, whereas others may be just now implementing company-wide recycling programs. No matter which green initiative you choose, in order to succeed companies must adopt a results-based, return on investment (ROI) focus that helps them to identify, develop and implement green projects that add value from an economic, environmental and societal perspective. In The Green Scorecard, business leaders from CEOs and CFOs, to project managers and engineers, receive a reliable measurement and evaluation system that delivers credible data for decision makers. 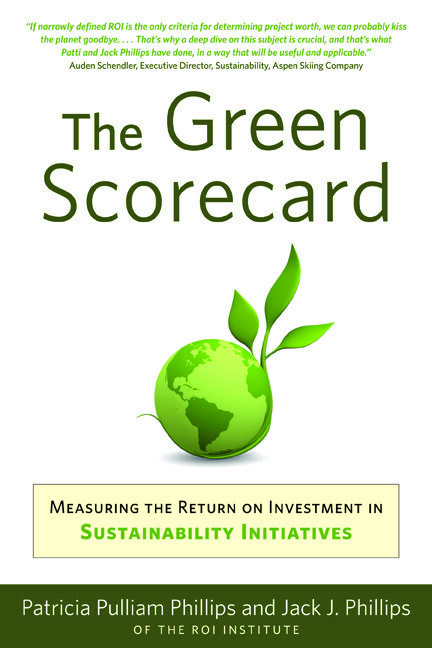 The valuable book, based on the ROI Institute internationally renowned methodology, gives you clear steps for determining the overall worth of green projects for both the environment and the bottom line.